I have a couple CAS cards I made over the weekend. They were very simple, but yet I really like how they turned out. I played in a challenge over at Cardz TV a couple weeks back and won this wonderful stamp set which has a ton of little sentiments on it. The little coffee mug is Jaded Blossoms Coffee Dies. The yummy whipped topping is embossed with the swirls folder. 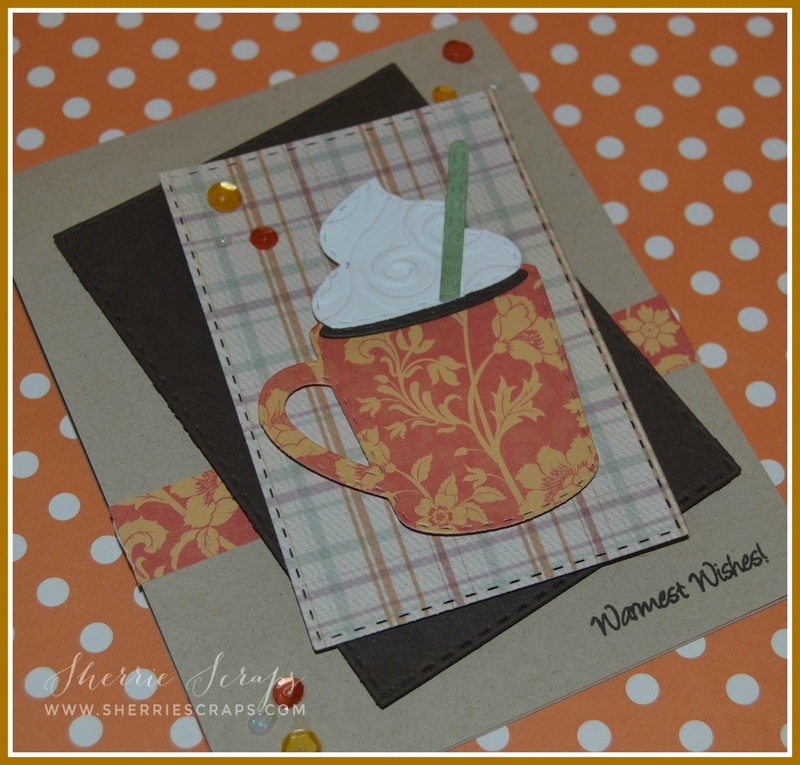 I added the sweet little sentiment using Cardz TV Mini Messages stamp set. I finished with cute little sequins and nuvo crystal dots in the corner. These are both so gorgeous, Sherrie!! I love the layers and the papers you used!! The embossing on the foam is a perfect touch!! Congrats on your win!! And thanks for playing along at DL.ART!! They are beautiful my friend!! I love the sweet sentiment, DP & JB coffee cup dies!Congrats on your win!! Beautiful card. Love the coffee cup and your colors. Cute cards! 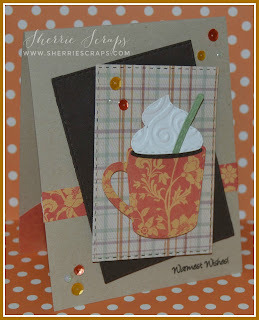 Love the embossed swirl whipped cream! Adorable cards my friend!!! I love that embossing ya did with your whipped topping there on your mug! Really pretty design and I love the colors! Sorry I haven't been around too much. It's been a busy couple of weeks and I haven't been feeling so great. On top of it all, I am taking a class online for meditation and healing. So that has been taking up a little bit of time too. But know that I think of you often and pray for you always. Miss you!!! And thanks for linking up in our FFC this week!!! Good luck! Super cute cards! The embossed whipped cream looks so amazing! I also love the CAS design! Congrats on winning! That's awesome! I love love love these!! LOVING that whipped cream and the colors!!!!!!!!!!!!!!! They are too cute. Love the layering and the embossing on the whipped cream is the perfect touch. My be CAS but they are awesome. They are so CUTE Sherrie! What fun cards! I LOVE the toppings embossed... looks Yumm-o! hahaha Fab cards my friend! So much fun Sherrie! I love the fabulous patterns on these papers, plaids and flower vines, gorgeous! A wonderfdul colour palette too, the black and white really pop against the warm tones! A bit of bling is just the thing, fantastic set!! What a perfectly YUMMY card! Love the plaid and the patterned paper you used for the mugs. Great layout too, these are super cute. 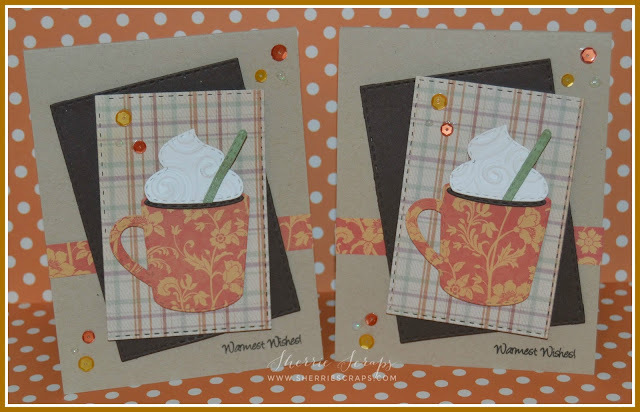 Love the paper piecing on those adorable cups! And what pretty fall colors and papers, too. I adore that touch of plaid! I loooove these! Wish I had one in my hand right now! Gorgeous cups!